BBC Broadcasting House on Portland Place W1 was seriously damaged twice during air raids in 1940. 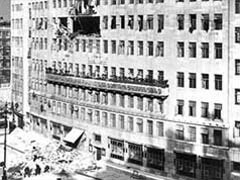 Just after 8pm, on 15 October 1940, the Corporation’s 1932 headquarters were hit by a 500lb delayed-action high explosive bomb.The bomb destroyed the BBC switchboard before penetrating the Music Library on the fifth floor. Staff tried to move it by hand, but it exploded during the attempt. Seven BBC members of staff were killed. Parts of the fifth and sixth floor frontage of Broadcasting House were blown into Portland Place: several studios disintegrated; glass and debris littered the roadway on Portland Place as far as the junction with Duchess Street. A small fire also broke out but was brought under control by the BBC’s own fire teams by 9.18pm. Broadcasting House's aerial mast, clock tower and south front entrance hall were not damaged. BBC eyewitnesses recorded that the nightly wireless news was still being read – by radio newscaster Bruce Belfrage – as the blast shook the building. Covered by dust in his basement studio, Belfrage paused slightly, then finished the nine o’clock news bulletin. Listeners heard the (muted) bomb blast live over the airwaves. 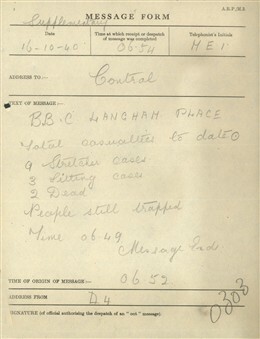 Messages telephoned to the St Marylebone Report Centre (at Marylebone Town Hall) from the local ARP Post (D4) show that emergency rescue vehicles and a mortuary van were requested at 10.35pm. ARP reports for 11.34pm initially suggested that injured BBC staff members were still trapped on the third floor but by 12.28am eleven casualties had been removed from Broadcasting House. A grim ARP message form received by the St Marylebone Report Centre at 9.15am the next morning underlined the bomb's horrific effect. The clear up continued throughout the rest of October 1940. Broadcasting House's original white Portland Stone facade was painted dark green. At 10pm, 8 December 1940, BBC Broadcasting House was hit again. According to a St Marylebone ARP report written on 12 December 1940, a parachute mine struck Portland Place, yards from Broadcasting House and the Langham Hotel. The parachute mine – an eight foot high black cylinder attached to a dark-coloured parachute canopy - was actually witnessed by a BBC Defence Officer on the roof of Broadcasting House. This observer had time to make a telephone warning, watching as it drifted slowly down. The mine’s parachute caught on a lamp post close to the Langham Hotel before detonating to devastating effect. It carved out a deep crater in Portland Place which rapidly flooded after the local water mains and sewer were ripped open. One police constable stationed outside was killed outright, a second was injured. 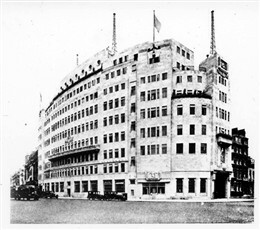 Broadcasting House and the Langham Hotel were hit by blast and shrapnel. 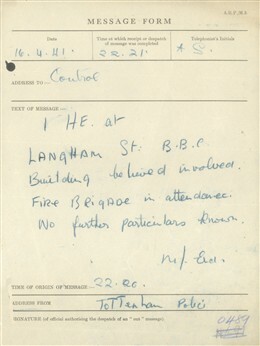 Fires took hold in Broadcasting House, in Portland and Langham Places for seven hours. The roof and spire of neighbouring All Souls Church, Langham Place were badly damaged. Several other houses on the western side of Portland Place – particularly 3 Portland Place - also suffered blast damage, hospitalising four residents. At Broadcasting House, the mine blast blew out many street-facing windows, tore though several offices and wrecked a car parked outside. Passing pedestrians and staff working inside were bowled over by the explosion. Small fires were again tackled by BBC fire squads. A more serious blaze on the third floor threatened the main tower and ventilation shafts until extinguished by the Auxiliary Fire Service (AFS). The basement studios and sub-basements suffered serious flood damage from fire hoses. Between 10.58pm and 12.36am, 9 December, St Marylebone ARP Posts D1, D2, D3 and D4 - handling the BBC and Langham Hotel incidents in tandem - requested the dispatch of stretcher parties, light rescue teams, mobile first aid units, mortuary vans and repair parties to the scene. The streets around Portland and Langham Places were roped off and the ARP and emergency teams set up dozens of trestle tables demarcating the piles of debris and the flooded bomb crater. Just before midnight, an urgent call also went out from the local ARP Posts for more ladders. 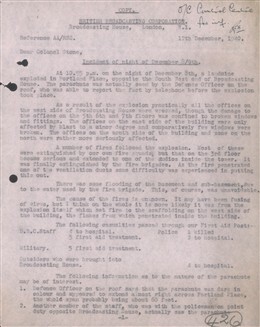 By 12.11am, 9 December, all casualties had been extracted from Broadcasting House; the fires in the building were under control by 12.28am. At 1.26am, ARP messages warned that gas was escaping from broken coal gas mains near to the Langham Hotel. By 1.57am the ARP had assessed the number of casualties in and around Broadcasting House at twenty; the dead policeman was taken to Paddington Mortuary, fifteen others were taken to Middlesex Hospital with the rest described as ‘sitting cases’. 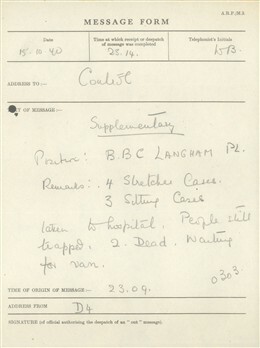 This figure was revised upwards at 9.19am to two dead and thirty stretcher cases.On 12 December, St Marylebone ARP arrived at a final casualty total: one policeman dead, two others hospitalised; four BBC staff hospitalised, five given first aid; five military staff and four other civilians hospitalised. In the hours following the bombing, the ARP worked rapidly - by 6am Portland Place was reopened to pedestrians. The BBC’s European Service began its broadcasts for 9 December 1940 from emergency studios in Maida Vale. After the December incident the main entrance to Broadcasting House (protected by sandbags and guarded inside by sentries and police since September 1939) was reinforced further with a pillbox and concrete and brick apron wall. Months later, BBC premises in the area still remained vulnerable. At around 10pm on 16 April 1941 a high explosive bomb just missed Broadcasting House, destroying parts of Chapel Mews, next to Langham Street. One BBC worker died in local offices. St Marylebone ARP messages record the dispatch of two ambulances and a stretcher party at 11.59pm to the front entrance of Broadcasting House.Just after 2am on 17 April another bomb hit streets in the immediate vicinity. BBC operations were not affected. 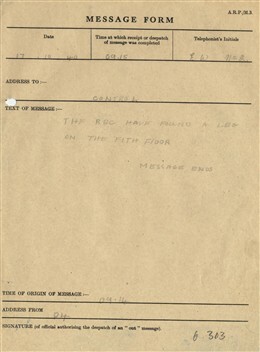 During the heavy raid of 10-11 May 1941, bombs again fell in the streets close to Broadcasting House. One BBC member of staff was reported killed. Fire also destroyed the adjacent Queen’s Hall in Langham Place, home since 1927 to the BBC Proms. Broadcasting House was spared further bomb damage, although in late 1940 some of its broadcast facilities and many staff members were forced to transfer to temporary studios at nearby 200 Oxford Street (among them broadcaster and writer George Orwell who worked from 1941-1943 for the Indian Section, BBC Eastern Service). The BBC Overseas Services also moved out of Broadcasting House to new premises on Oxford Street (today’s Orwell Studios at 24 Market Place). From 1942, BBC Radio continued to broadcast from the roof of this building, including during air raids. In turn, the BBC External Services redeployed to Bush House, Aldwych, itself later damaged in a V1 attack on 30 June 1944. Michael, Thank you for taking the time out to write us your mother's story. The Post Officer/BT tower is in the London borough of Camden so I am not sure that we will have any incident reports. However, I have passed your query to the archivists at Westminster Archives who will check it out for you and might come up with something. Thanks again! I worked for a firm in Langham street. On the night I was firewatching I went for a short walk, just along the street. While I was away the building took a direct hit which destroyed the building and damaged the BBC. Such is the importance of luck! At some point in 1940-41 my uncle, working for the BBC as a sound engineer, sat on the roof of Broadcasting House and made a recording of an air raid, presumably not one of the raids described here! It existed in my family as a 78rpm record until it was tragically broken. Is it possible it still exists in the BBC sound archive? I was actually working there that night as a messenger boy. I remember reading somewhere on this website that they were looking for people who had actually been there. Now I can't find that reference. However, if anyone wishes to contact me regarding the bomb I would be happy to hear from you. My late Father Joe worked at Broadcasting House and was in the air conditioning department and worked in the basement area, he was a shift worker and was not at work both times when the building was hit. I remember him telling me about the unexploded bomb incident, one of his work mates was a fireman in the building and according to reports was attaching a rope to the bomb when it expkoded, he was very upset at what happened and the death of his mate, my Father was an ARP. Warden in Harrow Weald and said that if he had been at work that fatal night he would have told them to leave the bomb alone and leave it to the Bomb Disposal Squad to defuse it, Les in New Zealand. PC 588 was the police man that was injured Mr Robert Arthur Mutimer. My grandfather. My mum was only 8 when this happened. We were always told it was a land mine that hit. According to his notes he kept . He says it was 10.55 pm that he was hit. Taken to Middlesex Hospital then transferred to Mount Vernon Hospital. In February 1941 he was transferred to the police nursing home in Chigwell Essex. Few days later a bomb dropped in the hospital grounds . He was shaken up by it and either fainted or was knocked out. For months and years after he suffered from vertigo and blackouts. 23rd December 1943 he was retired from the police on medical grounds. I believe we have a piece of the metal from the land mine. And that they found his colleague helmet on top of Aldwych church. Does anyone have any information of a baby boy left outside 200 Oxford Street (home of the BBC's overseas service at the time)? It would have been 20 October 1943. Perhaps a relative mentioned it, or it's mentioned in a diary of someone working there. I'm looking on behalf of the foundling, now 72. Thank you.